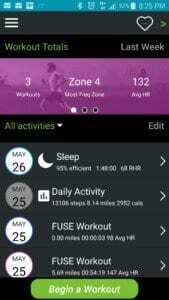 The Mio Fuse is a heart rate, sleep and activity tracker from Mio Global, the company best known for their wrist-worn heart-rate monitors. 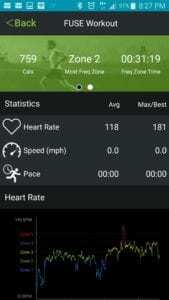 The Fuse has a built in optical sensor that measures your heart rate during workouts, and notifies you when your heart rate has reached your preset “zones.” It also measures your workout’s duration, distance, pace and speed. 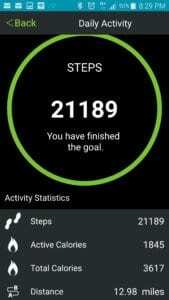 For everyday activities, the Fuse tracks total daily steps, goal progress, calories burned and sleep. 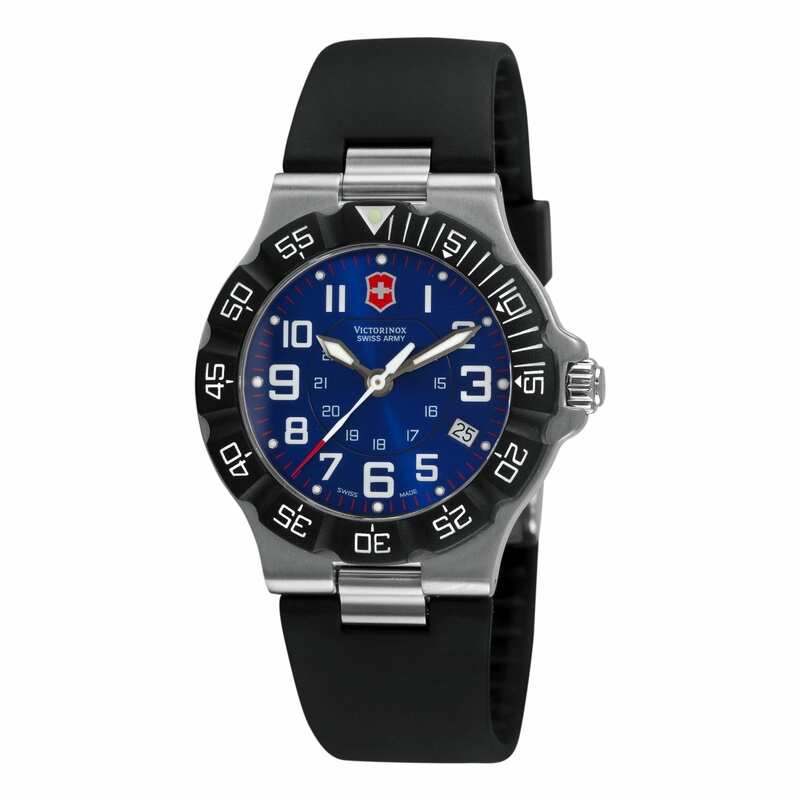 The Fuse is about the size of a standard digital watch, with a screen that is 1.2 inches wide by .5 inches tall. The band is made from a durable waterproof soft silicone that I found to be very comfortable. The Fuse comes in two sizes: large and regular. Each size comes in two available colors — aqua with a red display or cobalt with a white display for the regular, and crimson with a red display or cobalt with a white display for the large. While I liked the comfort of band, I did not like it’s two prong sizing adjustment and end strap snap lock system. If you don’t have the band tightened down on your wrist to snug, the two metal prongs stick up and will snag on just about everything, from furniture to blankets, long sleeves to pockets. As for the snap lock closure on the the end of the band, it sometimes comes unclipped and ends up flapping around. If you can overcome the snags, the Fuse does contour perfectly around your wrist, and never feels irritating and can be comfortably worn day and night. The Mio Fuse’s display is a scrolling LED dot-matrix that is customizable. 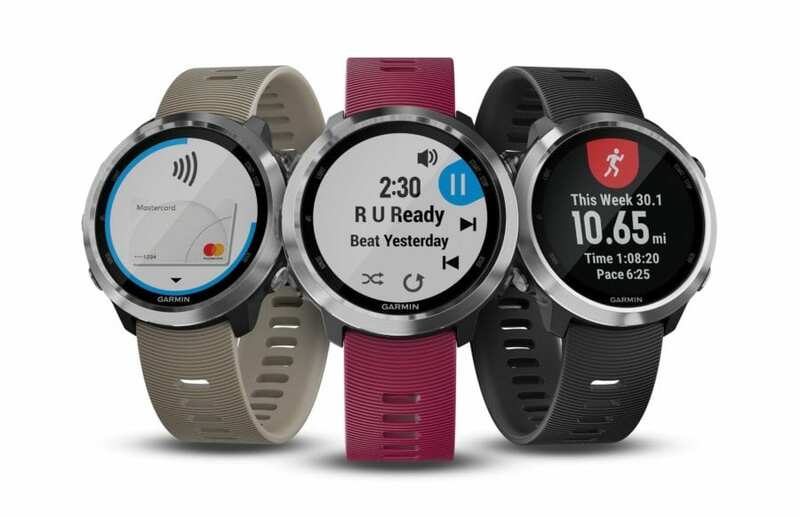 You can set up the customizable display on the Fuse to show or not show the following; on the all day screen – time, calories, distance, steps, and goal; on the workout screen – heart rate (always on), calories, pace, distance, steps, speed and time. On either sides of the display are a trio of raised dotted touch points that are very responsive and allow you to scroll left and right on the display, shifting through your chosen categories. 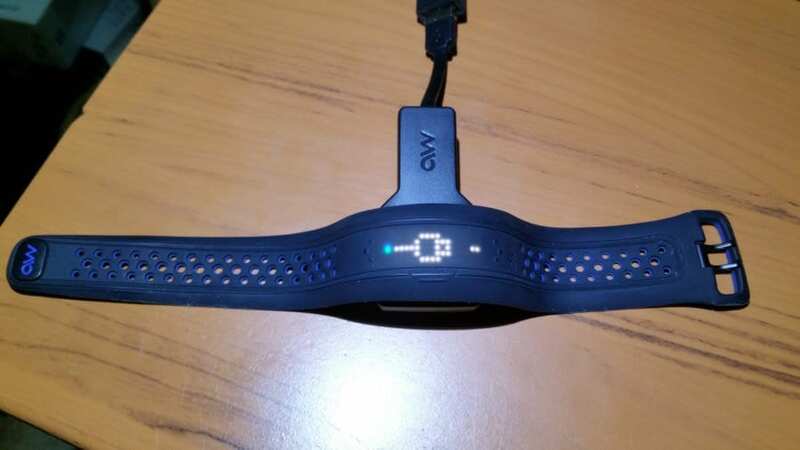 The other touch point is centered in the middle above the LED, that enables workout mode, hold it down to take acquire your heart rate and tap it a second time to start a workout. The LED screen stays off unless you tap one of the touch points to view your time or stats. So if you plan on wearing the device as a watch, there is no glancing down at it to find out the time, you have to tap it and then the LED will light up and display the time. 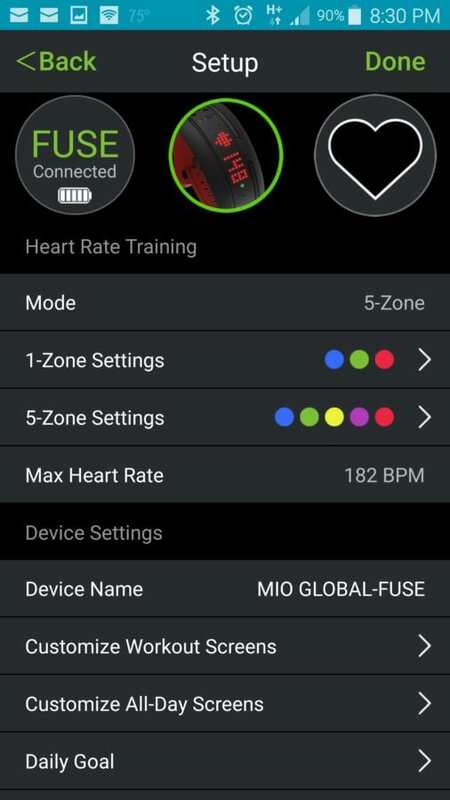 As stated above, to enter into workout mode, you need to hold down the center touch point and the Mio Fuse will then find your heart rate, once it is acquired, you will then tap the touch point again to begin your workout. 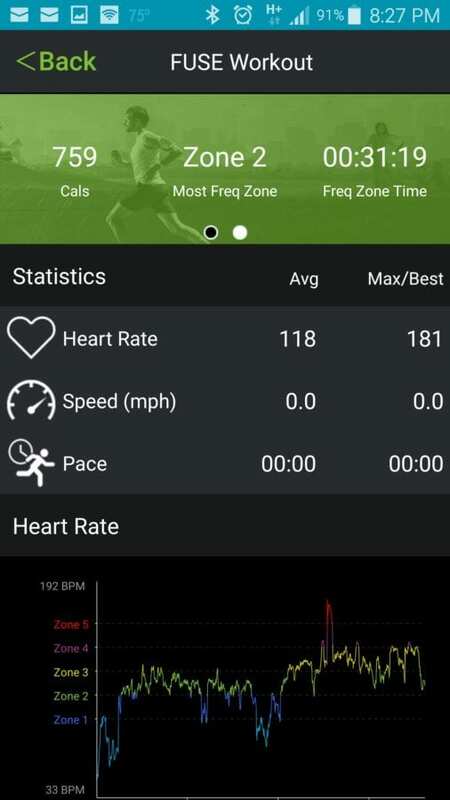 During workouts, the Fuse lets you know what heart rate zone you are working out in, via a small light that flashes on the side of the screen. 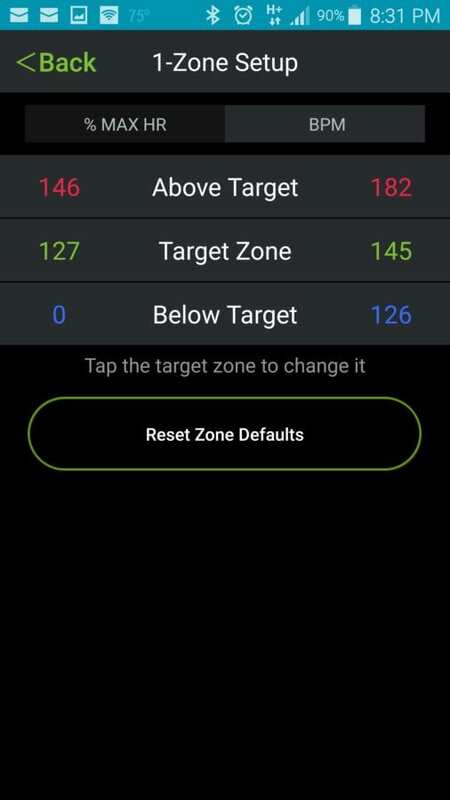 The light changes color depending on what zone you are in, which can be setup up through the Mio Go app. 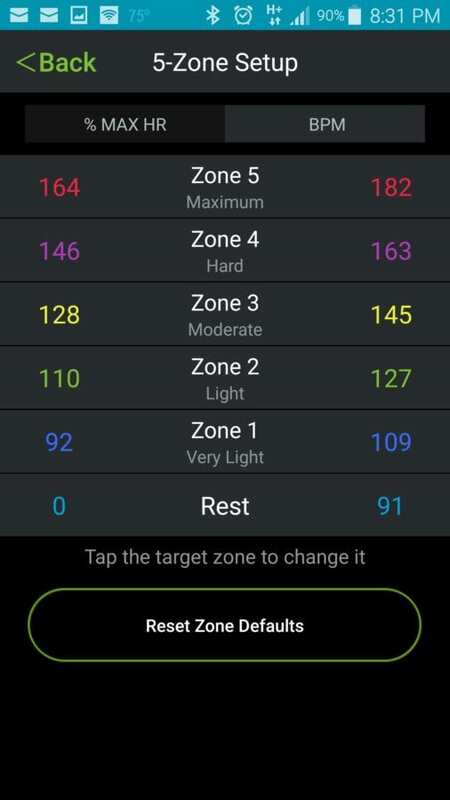 Zones can be set to 1-zone mode (three lights/zones) or 5-zone mode which runs from rest (blue light), zone 1 – very light (dark blue light), zone 2 – light (green light), zone 3 – moderate (yellow light), zone 4 – hard (purple light), and zone 5 – maximum (red light). 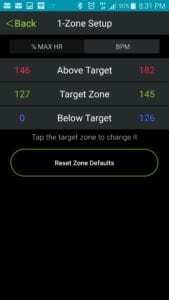 These zones are determined by your max heart rate which is defined in the app itself. 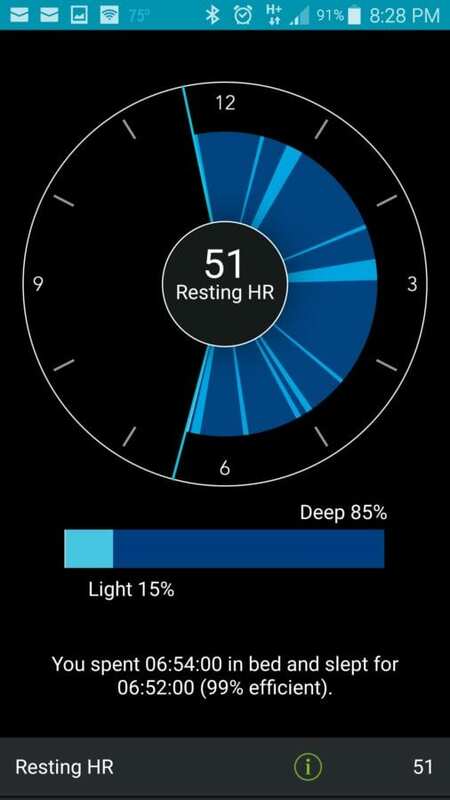 In addition to the light, you can setup a vibration alert that will let you know when you move to a different heart rate zone, so you don’t have to worry about glancing down at the watch. 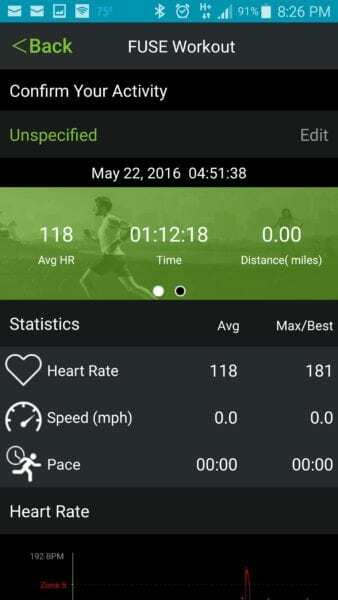 The algorithm that Mio uses to gauge distances for running is pretty darn accurate, for an algorithm. 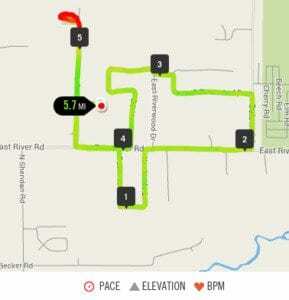 Tracked with GPS the mileage on one of my runs was 5.7 and the Fuse came up with 5.69, not bad. 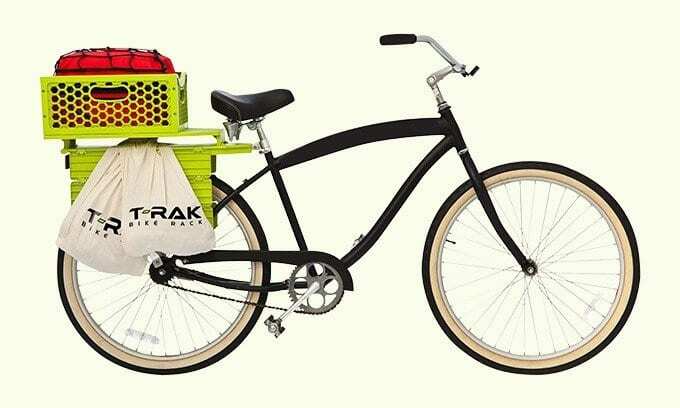 However, jump on your bike and take a 13 mile bike ride, the Fuse comes up with 0 miles for distance, which is to be expected. It did keep excellent track of heart rate and calories burned. But don’t get bummed out when you take a 50 mile bike ride and Mio tells you that you went no where. 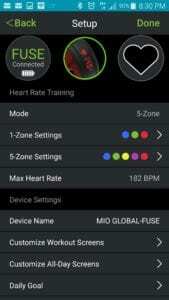 I ran the Mio Fuse up against Garmin and Suunto heart rate straps and the Mio Fuse is as accurate as either of these two HRMs, but without the hassle. 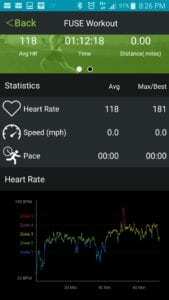 The heart rate monitoring feature is without a doubt Fuse’s biggest selling point and where it really excels. 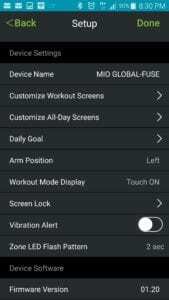 The unfortunate thing is the Fuse doesn’t offer all day heart rate tracking, only hr tracking in workout mode. 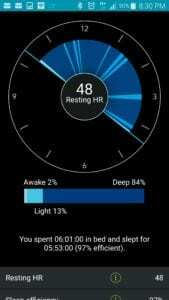 However you can still obtain your resting heart which can be tracked when you are sleeping and the device is put into sleep mode. 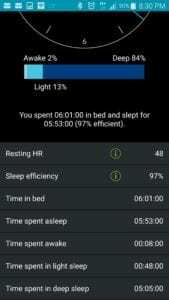 To get the device into sleep mode you need to hold down the trio touch points on either side of the display at the same time and the display will ask, “Sleep?”, touch the center touch point above the display as a confirmation and you are in sleep mode and the Fuse is tracking your sleep. While the exact start and stop of your sleep times are set by you, it can be a challenge to remember to start and stop the sleep mode. 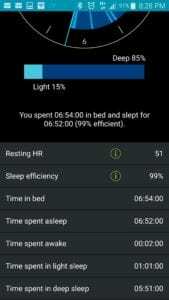 I am more accustomed to Garmin’s sleep tracker where you preset your sleep times at the beginning of setup and everything else is done for you – set it and forget it. 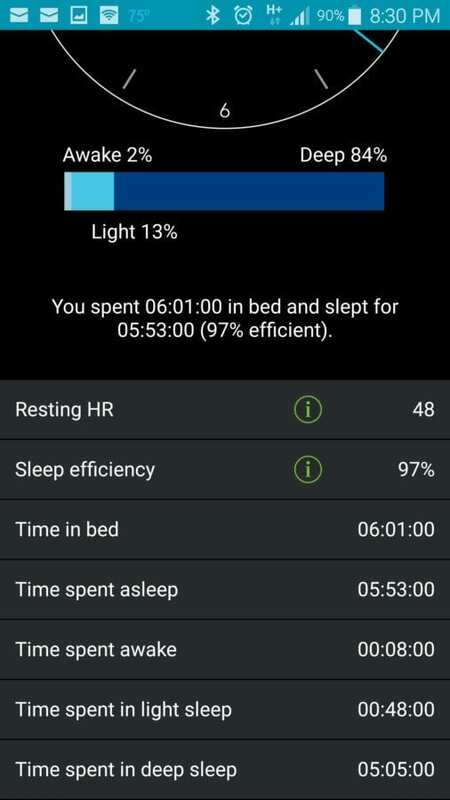 When I remembered to turn on sleep mode the device did a great job of tracking my resting heart rate and sleep efficiency with spot on results. 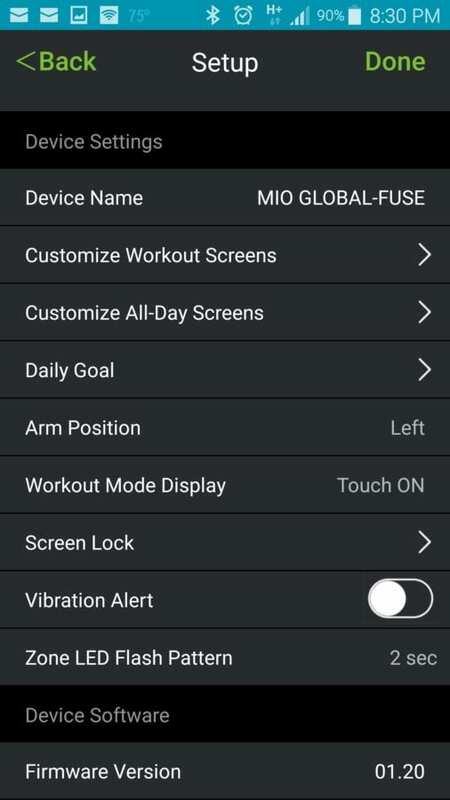 To setup and configure your Mio Fuse, you will need to use the app that Mio offers, Mio GO. 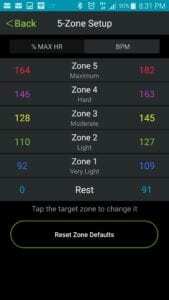 The app will calculate your max heart rate and zones using your age, if you know that your MHR and zones should be different, you can go through the settings and change those details as needed. Once those are set you are ready for start a workout. Daily syncing or after workout syncing is usually the best way to checkout your stats. To sync the Fuse to the Mio Go app, open the app, it then requests for Bluetooth to be turned on, which you allow. 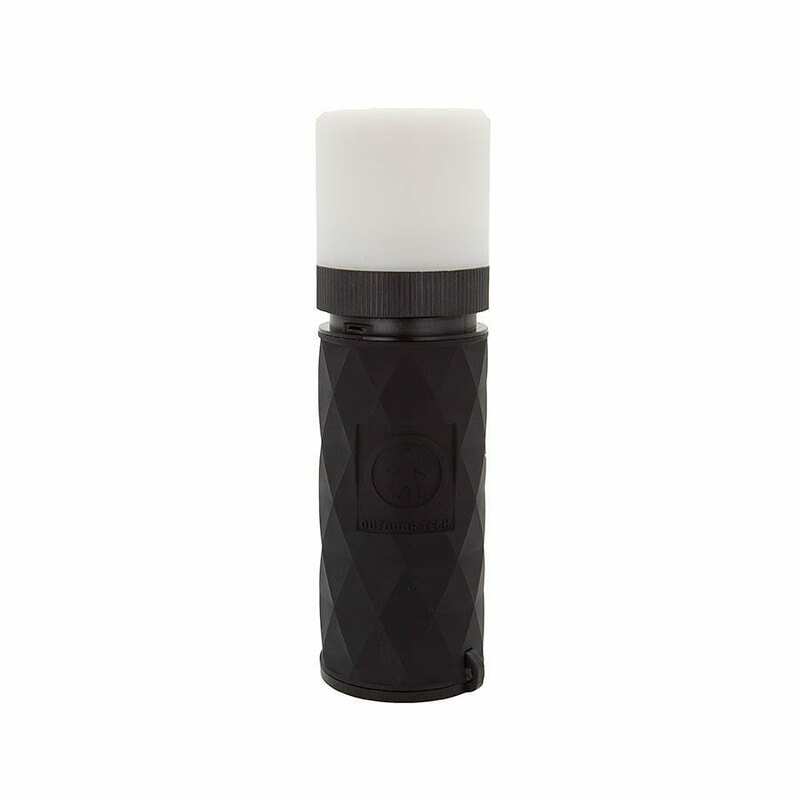 Wake up the Fuse by tapping on a touch point and within seconds the device connects to the phone, transfers daily activity, workouts and sleep. The Mio Go app displays the most basic of information; a summary at the top of the app that displays – number of workouts, most frequent zone, average heart rate, time, distance, calories, elevation gain for this week and last; and then a dated list of clickable daily activities, workouts and sleep. 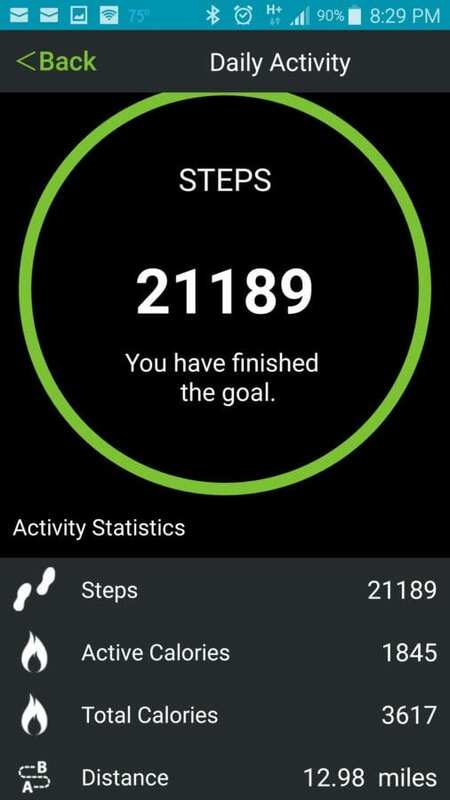 Clicking on and expanding the daily activity it displays your total daily steps, steps to goal, active calories, total calories and distance. 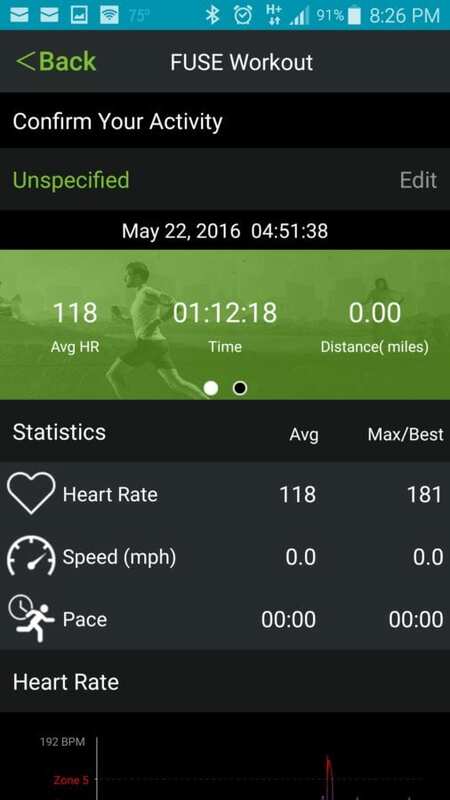 Expanding the Fuse workout brings up heart rate average and max, speed avg. and max, pace avg. and max, as well as a colorful heart rate zone graph. 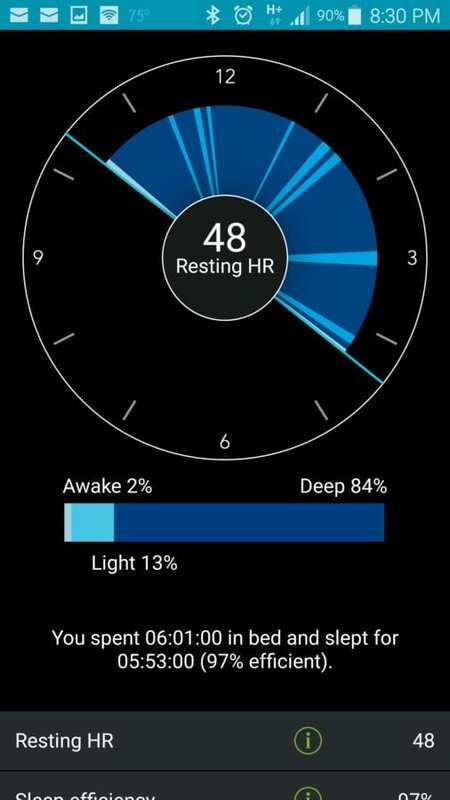 Expanding the sleep tracking will show you a graph of awake, light and deep sleep and also display your resting heart rate. The Mio Go app is a simple, straight forward, no nonsense app giving you exactly what the Mio Fuse collected and nothing more. Should you need to share on social media, track your calories or connect with buddies the Mio Fuse is compatible with Strava, Endomondo, Runkeeper, MapMyRun and others. 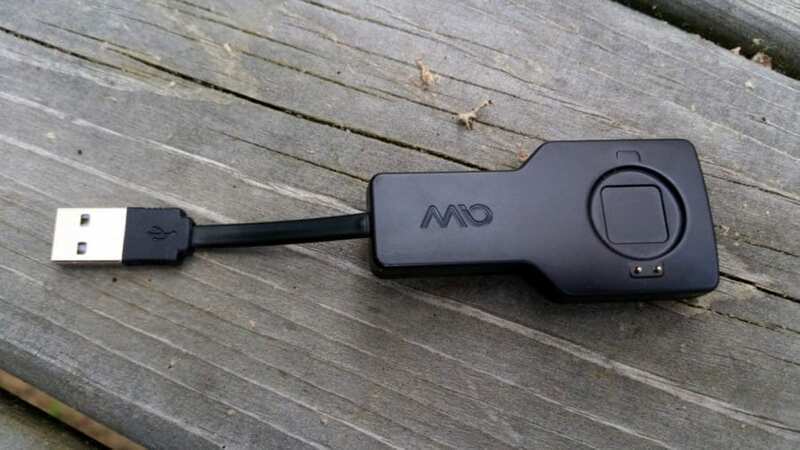 The Mio Fuse is also compatible with ANT+ devices, should you choose to ditch the HRM chest strap and run or ride more comfortably with this wrist strap. Mio’s claim on battery life is 6 to 7 days with one hour of workout time (heart rate monitor turned on) a day. 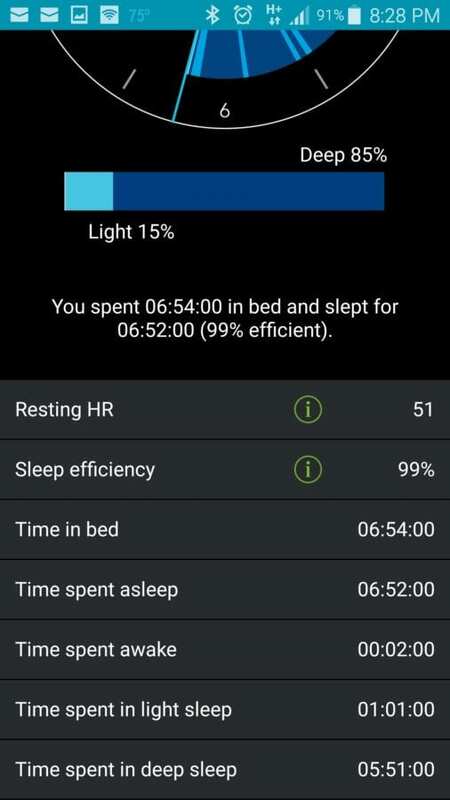 My testing came in fairly close to this at a recharging at 5 to 6 days with workouts ranging from 30 minutes to 3 hours, overall I would say to battery life is towards the top in the heart rate activity tracking category. Charging the Fuse requires their proprietary charger, which is a tiny magnetic plate that holds the Fuse in place when charging, it has a three inch USB cable that conveniently tucks away on the underside of the charging plate. 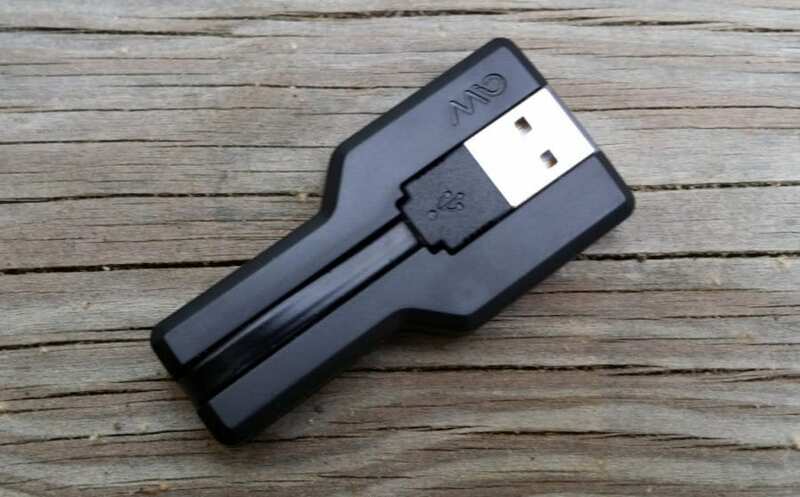 The Mio Fuse is a very comfortable and extremely durable device. If you’re looking to get away from the uncomfortable HRM chest straps, the Mio Fuse is a top choice, with it’s extremely comparable accuracy. 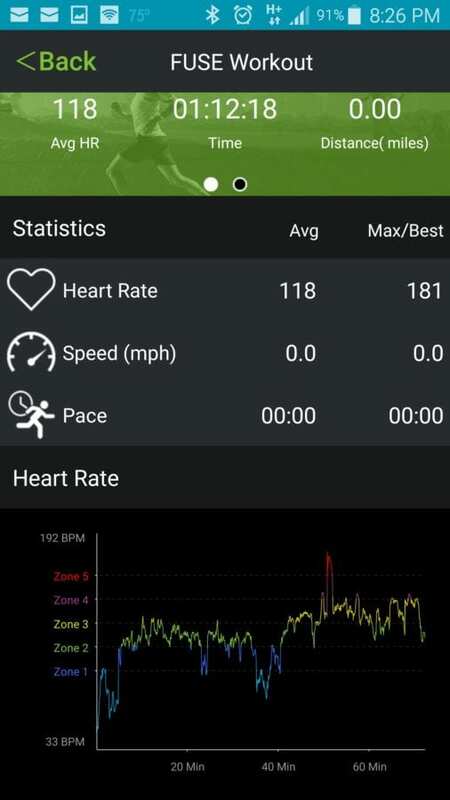 The heart rate sensor is enabled only when you are doing workouts and doesn’t offer real time tracking like what you get with the Fitbit Surge or the Basis peak. 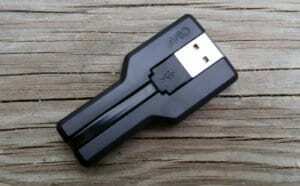 Other trackers continuously have the HRM enabled. One thing that I like about the workout mode is that there is another LED lighting up along with the digit display. This LED changes colors as your heart rate increases so you know where you are at in your training. It also has vibrational feedback to indicate your heart rate level.